Do you struggle with clogged drains in your Scotts Valley, CA home? Call us today and we’ll send one of our skilled, professional plumbers out to remove that clog for good. We now that a clogged drain can ruin your day, and we don’t want that to happen. Let a trusted plumber figure out what’s going on and come up with a solution to get your home running smoothly again. 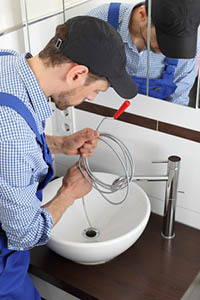 Our plumbers are trained and skilled, and they are experienced in dealing with a wide variety of plumbing issues, including removing all sorts of drain clogs. Whether you have one drain clogged or several, whether the clog is big or small, we’ll figure out a way to get it out that is minimally invasive and efficient, so you can get back to your normal life as soon as possible. Can You DIY a Drain Cleaning? Many people like to try and tackle plumbing jobs themselves, to save time or because they find it relaxing to problem solve like that. If you have a simple clog or a background in plumbing, that can be a great idea. Otherwise, you can damage your pipes. The first step to cleaning a drain yourself is usually to use a chemical solvent to dissolve the clog. You can find these at your local hardware or home good stores. As long as you read and follow the directions on the bottle, these are pretty safe. Usually, you pour a certain amount of the cleaner down a clogged drain. Then you wait for a specified period of time before running water down the drain. Hopefully, the solvent fixed your problem and the clog is gone. The danger of using solvents comes if you leave them in your drains too long. The chemicals are designed to dissolve the clog, but they can also eat away at your pipes if they sit in there for a while. Follow the directions, and you shouldn’t have a problem. If your snake is too small or the metal that makes up the flexible tube is brittle or weak, you can end up getting the snake stuck in your pipes. That usually requires a much more extensive repair than a simple drain cleaning. If you don’t want to bother trying to clean your drain on your own, or you don’t want to risk damaging your household plumbing, give us a call. We’ll find a time that’s convenient for you, show up on time, and get the job done quickly. If we suspect that your clogged drain is a symptom of a larger problem, we’ll let you know that, too, and come up with a plan to get it solved.